The choice is stark: Former Republican U.S. Rep. Ron DeSantis hopes to ride President Trump's backing to victory, while Democratic Tallahassee Mayor Andrew Gillum hopes to energize his party's voters as an unabashed liberal. 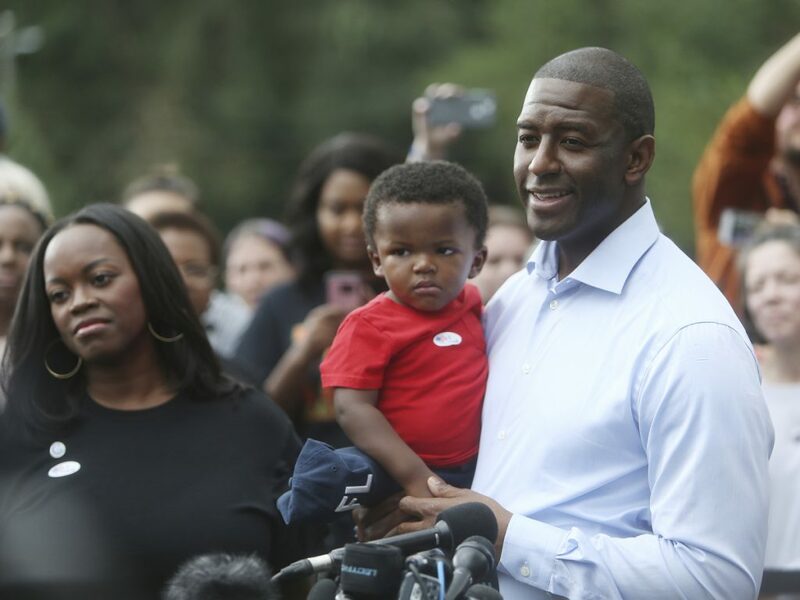 TALLAHASSEE, Fla. – Voters were deciding Tuesday whether to keep Florida under Republican control with a close Trump ally or elect its first Democratic governor since 1994 – and the first African-American – after a campaign marked by a deadly hurricane and gun violence. Former Republican U.S. Rep. Ron DeSantis hoped to ride President Trump’s backing to victory in the governor’s race Tuesday, while Democratic Tallahassee Mayor Andrew Gillum sought to energize his party’s voters as an unabashed liberal. Carrying a “Veterans for DeSantis Nunez for Governor” sign, former Army Sgt. Dave Matthews said DeSantis supported veterans, which is why the candidate had earned his support. “We can’t have a socialist state, especially with the health care. We just want to protect our borders,” said Matthews, who lives in an Orlando suburb. More than 5.2 million Floridians had already voted before Election Day – with Democrats casting slightly more ballots than Republicans. More Democrats voted early in 2016 also, but Trump won the state due to a GOP surge on Election Day. “It appears there was a printing issue,” Supervisor of Elections Ron Turner said. Voter Ryan Mach was one of the voters turned away. “They scanned my license, and then they said, ‘We don’t have a ballot for you,”‘ he said. This election – expected to be close – could shake up the political landscape in the nation’s third largest state. The last time Democrats won a Florida governor race was Lawton Chiles’ re-election in 1994, and Republicans have controlled the Legislature since 1998. But the past two gubernatorial elections have been close. “Us winning tonight, I think, will send a message to Mr. Trump, and Mr. DeSantis as well, that the politics of hatred of division and separation, that they’ve come to an end,” Gillum said. The mayor has been hampered by allegations of corruption, based on an FBI investigation into Tallahassee City Hall, though Gillum has said he’s not a target of the probe. The winner could play a major role in the 2020 presidential election. Florida is the largest state with a history of swinging either way. DeSantis could have a chance to return a favor for Trump, or Gillum could help boost the Democrats’ nominee to challenge him. Associated Press contributors include Jennifer Kay in Miami Beach.